SoftServe is taking the world of sports to a new dimension with help of VR and body tracking in its VR Gym application developed by the company’s by R&D division. In this case study we will explore how boxing training is being enhanced with the help VR tracking as the user is taken to a new virtual training gym. 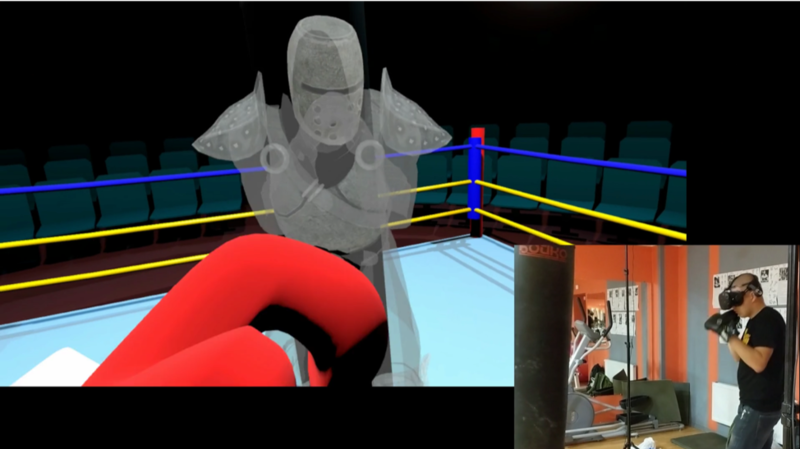 SoftServe developed a cutting-edge boxing application that merges sports equipment with virtual reality (VR) devices to discover new interactions in the virtual world utilizing physical objects. SoftServe’s R&D team conducted initial research on ways of uniting physical interactions with virtual reality. In their research, the team explored the idea of transferring contact with a physical object tracked to its full virtual copy in virtual reality, giving the user the physical interaction with the object while staying in virtual reality. The primary obstacle was the physical interaction component as there was no simple way of transferring hand touch sensing due to the inability to track fingers and objects in the real world with sufficient accuracy. However, interaction with objects is not limited to gentle touch and can include interactions with applied force. In such cases the user’s sensory inputs are limited to resistance and surface hardness as a result of their interaction. The R&D team’s task then moved to selecting the appropriate intermediate tool that would let them maintain the interaction as close to reality as possible without limiting the user’s sense of interaction. Martial arts by nature is a forced interaction with a set of equipment such as punching bags, wall bags, and intermediate sports equipment that protects the user from injury. The Vive Tracker was selected for this application as it is a small device able to track its own position and report this to the VR environment. The equipment selected to exist in both the virtual and real spaces consists of a punching bag, boxing gloves and sneakers. To keep user motivated the team developed multiple modes of interaction and included gamified experiences to make the experience more engaging. For software solution base, the team utilized Unity as a fast, reliable prototyping tool with additional assets for resolving separate tasks. The application is a virtual boxing ring experience with rich graphics and sound. The experience consists of predefined gamified modes to keep the user engaged. Tutoring mode – teaching users to box with previously prepared hand recordings and visualizations. Rhythm mode – punching sessions aligned with song rhythms, creating an experience similar to dance arcades. Sparring mode – sparring with a virtual boxing partner. During post-injury medical rehabilitation it is important to monitor the progress of a patient visually using measurement tools. Tracking of the human body during exercise can provide critical information about the current state of rehabilitation and progress. In industries that require the training of personnel, conducting this in virtual reality can reproduce a range of different environments in a safe manner - from everyday working conditions to hazardous environments. Scenarios can be arranged to teach, train, and evaluate skills; looking at the speed and effectiveness of the user’s actions in real-time. Future development for SoftServe’s VR Gym is aligned to exploring how the efficiency of training increases for athletes in these environments and how multiple-users in VR environments can help single users take part in team-based sports.